« Wow, Who Would Have Predicted This? an excellent column that is well argued and supported. the issue we run up against is that humans are not rational about this. i remember doing experiments in economics as an undergrad. you can have $5 and i can have $7, or you can have $3 and i can have $2. the majority picked the latter. relative position winds up being more important to most people than absolute gain. as a result, electorates choose the option in which everyone is worse off. so, unfortunately, what we SHOULD care about and what we DO care about seem at odds. this is not a problem that manifests itself in an economy until one adds in coercive wealth redistribution by government, but alas, it is also precisely the issue that gives rise to demands for such. Serious Q here: What, precisely, is "income", and how does one compare "income" across different economies? GINI coefficients are a way you can reinforce popular misconceptions while sounding sciencey. If you do a broader look at conditions in different countries, then middle and low income Americans are better off than almost anywhere else in the world. Eyeballing this chart, note that a GINI coefficient for the lower 80% of the citizens of each country would be about the same, and Americans would clearly be better off with the higher overall level of income. The discussion is really about the super-rich 20%. 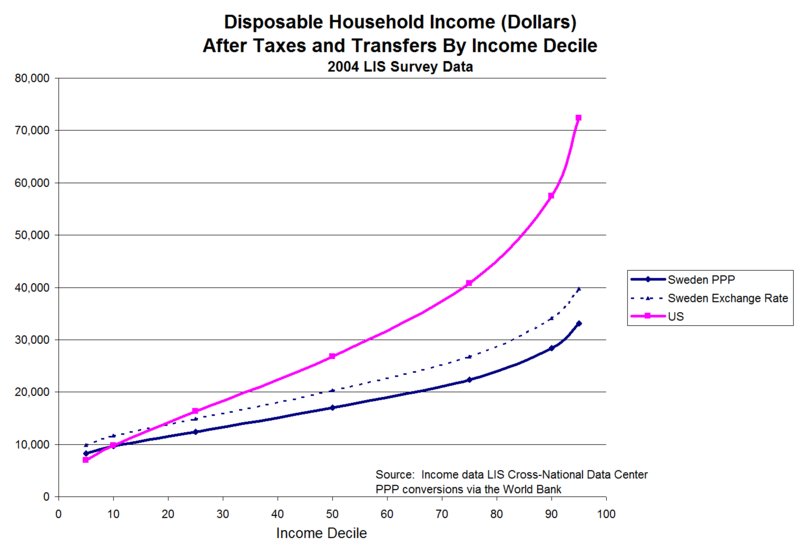 I would deeply welcome a real discussion about whether income distribution in the U.S. is truly bad at all. People in the American top 20% are extremely capable professionals, and those in the American top 1% have changed the human condition forever. It's not the same thing as in Zimbabwe, where powerful people have seized everyone else's resources. It's also strange that we expect maps measuring human well being to follow political boundaries, resulting in coloring in nearly empty areas in deserts or tundra (Sahara, Russia, Canada) being solid colors. But the sand or scrub bush or whatever doesn't care about human mortality rates or educational performance indicators. It would make more sense to illustrate these things based on where people live (closer to how a density map looks), maybe by using overlapping circles or 3D-style bars to indicate number of people under that condition. At the very least, some sort of subnational reporting would be more accurate, if available. On a color coded world map for PPP, China has a low-ish ranking, but within the country it should be high in certain big cities and very low outside them. Same for the US, where areas like NYC have super high PPP but places like Pine Ridge reservation have considerably lower rates. There's no real reason that Russia and Luxembourg are equivalent districts for measuring human welfare, unless you're trying to make a polemical point about policy regimes. But it's just the easiest way to report it because that's how the data is usually provided. the “happiest” place on Earth). Notice her ongoing, what?-no-free-lunch? dispersion (what Obama & Co. is trying to sell you a remedy for). after they were born never got counted. I see the point of your argument, and I have a fair bit of sympathy for it. But doesn't the left count as part of the Swedish/etc model benefits such as national health care that wouldn't be included as 'income'? many of these are effectively in a much higher income bracket from a PPP pov. You touch on the Pareto Principle, which holds remarkably constant across ethnic, racial, and national divides. If you look at the top 20% of income earners (a slice that earns about 80% of all income), the top 20% of *those* earners earn 80% of *that* 80%. The principle is applicable to many different factors of wealth and even things that have nothing at all to do with wealth. The point being...that concentrated wealth seems to be an immutable fact of existence, regardless of the normative desires of social engineers and other assorted leftist retards. Without reading the methodology behind the data, there's no way to know whether or not state-provided health care is included in "Transfers." Food stamps, subsidized housing, and tax credits undoubtedly are, though. Other things that the left count as benefits that can't be quantified as income include bigger government, loss of liberty, and more control over the minutiae of life. Some income inequality analysis are more equal than others. Do you have a cite to support that last paragraph. It wouldn't surprise me much, but it is the sort of claim that warrants being supported by evidence. What's wrong with income inequality, exactly? If my income grows at an annual rate of 10% and Warren's grows by a rate of 100%, what's wrong with that? 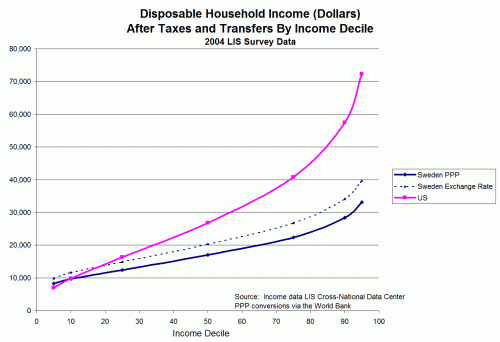 What are the ill effects of our incomes continuing this pattern, say, indefinitely? Thanks Mercury, I've used this same stat many times myself and people just can't believe it. Our Ukrainian nanny couldn't believe the lengths we go to here to save babies born with problems (and quite successfully) when in other countries they'd be set aside and left to die. Beyond the moral questions, the differences in how the metric is measured is never acknowledged by those who want to beat up on our supposedly inferior medical system. I'd love to see the data that shows the US being stingy to include both government and private charity. Given that the US is the most generous nation, by a long shot, with private charity, I'd bet we'd come out much better that way. Warren, I shared this graph on FB and someone pointed out -- fairly, I think -- that the U.S. curve does not include some spending on health care and college expenses that Sweden has already paid for via taxes. If you subtract those expenses out to get more of an apples-to-apples comparison, the U.S. line will drop or rotate downward by some amount, possibly a sizable one given the cost of college. such developments in neo-natal care didn't come from the US) can do now. I personally know three healthy, normal, thriving kids that looked like rabbits when they were born. Maternal infanticide across countries/cultures is another real grey area too. It would be really interesting to see if (and how) health care is taken into acoount in those numbers. Here in Sweden, the government provides health insurance. The maximum you pay for your visits to the doctor is 150 dollars per year. The maximum you pay for medicine is 300 dollars per year. Spending your time in a hospital bed costs you 15 dollars a day, whether it's because of a broken leg or leukemia. I doubt you can find any health coverage in the US that will provide that at the same cost as the difference in disposable income between the two countries -- at least if your income is relatively low. And if I remember correctly, it does this at a MUCH lower total cost than the US system. Of course, like the US system, it needs more and more money each year, because people live longer, and new and more expensive treatments become available. It will become unsustainable sooner or later, but at least this cost problem starts at a much lower level than the US one. Perhaps this is due to the fact that the US is overlawyered, which inflicts a lot of costs for legal reasons rather than medical reasons. The swedish system isn't perfect, of course. Doctors and nurses have low salaries compared to most industrial countries, which means there are almost always too few of them. You might have to wait several months for trivial operations, and you rarely see the same doctor twice in your neighborhood clinic. And the overall quality of said clinics isn't always very good -- it's not hard to find swedes who can tell horror stories involving incompetent doctors. Speaking of horror stories, I actually have one to share myself: last winter I was diagnosed with leukemia, but it wasn't because my doctor at the neighborhood clinic knew what he was doing. When I came to him, complaining about feeling increasingly tired, to the point where I could not walk between rooms without needing to sit down and rest, he talked about stress and relaxation techniques instead of taking a blood test. It was because a competent colleague of his, be mere chance, happened to look at my papers and questioned why he didn't test my blood. She asked me to come down RIGHT NOW, and sure enough, my haemoglobin was less than a third of what it should have been. Three days later I was diagnosed with leukemia, and the treatment started on day four. Chemotherapy isn't exactly a walk in the park, but most things worked really well from that point. Today I feel fine, although my immune system, being totally new after a stem cell transplant, will always be inferior to other people's immune systems. Dare I ask what this would have cost me if I had lived in the US? What if, for some reason, I didn't have health insurance? Anyway, my impression is that the swedish health care system seems to work extremely well when it comes to life-threatening or urgent situations, and not so well when it comes to other things. But it seems like a good deal if your income is relatively low. One of the other big factors you have to account for when trying to compare life expectancy / mortality stats across countries as a measure of quality of health care systems is deaths resulting from violence as these deaths don't generally relate to the quality of health care. Once you adjust out the effects of murder / suicide, the US has one of if not the best life expectancies in the world. Just imagine what they would be without record obesity. Warren, just to pile on...this is a friggin great article! Finally I have something to point people to for an argument that I've been making for a long time, but didn't have an easy way to show any data to support. It drives me nuts that people define poverty as the "bottom 'x'%" as if that is meaningful. Our "poverty" is something that many in the world "aspire" to, as they understand that opportunity (to ride your pink wave) awaits them and their children like no other place on earth. Has anyone studied to what degree culture and education have an impact on this? There are certainly issues with the US system as it currently is, and even worse with what it will be (Obamacare) based on recent news. That said, if you were an ambitious 20 year old starting out, would you rather be riding the pink line or the solid blue one? Chances are that your medical insurance plus other out of pocket expenses would be well more than covered by the delta between the lines. Your cumulative life time additional earnings could more than make up the life time cost of the "free" care of Sweden. Add to that the benefits of a more customer oriented market response to medical care, with all the implications that has for improving your condition, or prolonging your life, and comfort. The focus should not be merely on the "free" aspect (which it is not - elevated taxes cover that), as there are plenty of non-monetary costs that come with government provided medical coverage, some of which you just articulated. If the issue is to provide catastrophic medical insurance for those who cannot afford it, there are certainly much much more efficient means of providing that than a single payer system, or the monster that is Obamacare that we are about to face here, or some other government hybrid control of the market. True, the Obama system seems like a disaster. The reasoning behind it seems to be the typical leftist reasoning you hear all over the world: "everything to everybody, don't worry about the costs, we will take care of everything for you if you just let us organize things!" That said, I think it is worth pointing out that not all governments are as inefficient as the US one. I think the swedes are much more tolerant of high taxes because of this -- many "government things" seem to work pretty well here, compared to how the US government handles things. Many americans who have been to Sweden say that, like in Germany, "everything just works." This is not all true, of course; there are plenty of things that don't work, but I would say most things do work. Take the swedish IRS, for example. Although the taxes are (too) high, the system in itself is pretty simple, and the bureaucrats who work there are very helpful, and do their best to assist you with your tax troubles. Whereas the impression I have of the IRS in the US is that most of their bureaucrats are either stupid, incompetent or downright evil, or a combination of all of the above. And although Sweden is socialist country by american standards, many things here would find approval by libertarians: starting a company here is a lot easier than in the US, the telephone and cell phone market, like most markets, has been deregulated since the nineties, we've had a school voucher system here for just as long, and many government-funded things are carried out by private entrepreneurs. In Stockholm, we even have an emergency hospital that is privately run, within the swedish national insurance system. My four year old daughter goes to a pre-school where one of her three teachers always speaks english with the kids. She is near fluent in english now, or at least as fluent as a four year old can be. I chose that school for her, and the government pays for it. That is a huge improvement compared to what the conditions were when I went to school: politicians and bureaucrats decided what school I should go to, and exactly what I should learn, and when I should learn it. If I were an ambitious 20 year old, I think I would go with the US system. But not all of us are ambitious 20 year olds, and even if we were, many diseases, like leukemia, can and will target even 20 year olds, when they don't have a lot of money to cover the bills. I'm not advocating Obamacare by any means, but I think most americans would like to have some sort of catastrophic medical insurance for situations like this. From what I've read, Singapore has a system that might be worth looking into: you pay for most of your medical care out of your pocket, or through private insurance, and at a much lower cost than you do in the US, since they don't have as many lawyers to drive costs up. But if a medical catastrophe occurs, the government steps in. That chart above I think says a lot about the actual price people pay for letting the government intervene in so many aspects of life, even if one could count on a superior "just works" government over the long haul (I have my doubts about the possibility of that because of adverse incentives both within the administrative bureaucracy and within the political class). Think about the above chart, and think about the financial mathematics of compounding. Over time, the overall wealth effect will far far outweigh any benefit that might be had in the near term. I'm not familiar with Singapore's system it so not sure if by "government steps in" means government pays/subsidizes the purchase of insurance, or if government pays the hospital (acting like the insurance company), or if the government is running the hospitals for those who cannot afford it. insurance" in the US. If that is what you mean, then, yes, if the US would simplify all its programs related to healthcare to be essentially catastrophic coverage, the costs would be a fraction of what they are today. The government could provide that kind of coverage efficiently (through a voucher) and still have billions left over. That is before dealing with some of the other issues you and others bring up. Instead, we have a poorly constructed mash up of insurance and effectively income supplements on a specific class of expenditures.